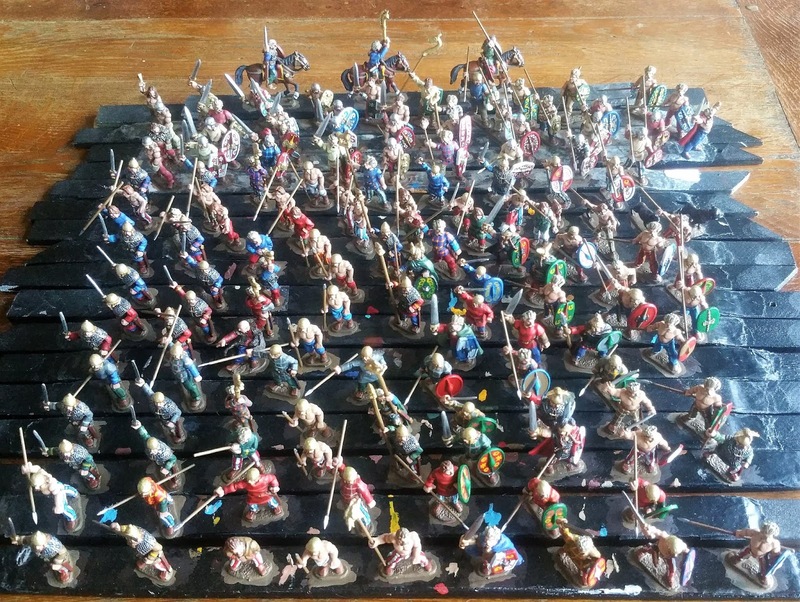 I've mentioned that I'm putting together a large army of Britons for my Mancetter 61 CE game at Salute. Here are the first of (hopefully) two groups of reinforcements, fresh from the brush of Shaun McTague. I have around 300 painted and based warband minis already, and these c.150, with 50 from my loft-box of "reserves", give me around 500 minis. My plan was to add another 100 Black Tree minis, to increase the variety of poses, but I've been waiting for these for 7 weeks and am very nervous about whether they will arrive in time for Shaun to paint them- or, indeed, at all. :-/ If anyone has any unpainted (or painted) Black Tree Celts that they are prepared to part with, please drop me a line! Once all the minis are finished and married up with the shields that I've been working on since Christmas, I plan to re-base the entire army at 16 units on my new-style wobbly-edged bases. I don't have very much spare time, so it'll be a challenge! I also need to base around a dozen units of slingers and some light horse.